Quick update this week! Alec and I are starting to kick the production of DTZ6 up! Both of us are really committed to getting this out by the end of the summer! One of the more daunting tasks on my list of DTZ6 to-dos is the transcribing of an interview that I did at Stern HQ. There, I got to talk to Jody Dankberg, Steve Ritchie, Mark Galvez, George Gomez, and Gary Stern. Phew! Not everything will make it into the issue, but I'm going to be transcribing it for posterity. Ha ha, that's right, I'm old school! I got this audio recorder in college, and it has served me well ever since! If I can digress for a second, I just want to stress that this recorder is the Roles Royce of audio cassette recorders: the Sony TCM-210DV Voice Recorder! JUST LOOK AT THIS THING! You can change the speed that you record and play back content! You can change the recording setting to double so that you get double the millage out of your audio cassettes! There is a pause switch that allows you to pause either your recording or your playback. In summary, the recorder is cool, and transcribing the interview has been a lengthy process. The highlight was easily when I realized that the meeting between me and George Gomez was captured here ON TAPE. NERD. OUT. A couple weeks ago, my fellow Center for Cartoon Studies faculty member and all-around great guy Stephen Bissette handed me an article that he had cut out from Wired magazine. It had been delicately cut out of the magazine, and all 3 pages had been placed in its own manilla envelope with "FOR JON CHAD! ABOUT PINBALL!" scrawled across it. He gave it to me, knowing of my love of pinball. I just got around to reading it last week, and it was a very surreal experience. "Toll the bell, Pinball...is dead"
"Pinball machines were too heavy, bulky, and delicate...the arcade dinosaur had met its mammal"
"In retrospect, pinball was only a bridge between the machine age and the digital age. Like it or not, we have reached the farther shore." What is all this about? I thought that we were living in an age where you couldn't swing a dead cat without hitting an article from a local paper writing, "remember pinball?!" in reference to some new barcade-type outfit opening up. This is supposed to be the fat years for pinball, right? What's going on!? In full disclosure, I only got one page into the article before I stopped, and it finally dawned on me, "wait, when was this written?" I know that that must seem like the dumbest thing in the world, but I really hadn't thought of it. So, low and behold, this was written in February 2000. Doing some quick math, that's, like, 4 months after Williams closed the doors of their pinball division. FOUR MONTHS! Suddenly, the article took a new light. 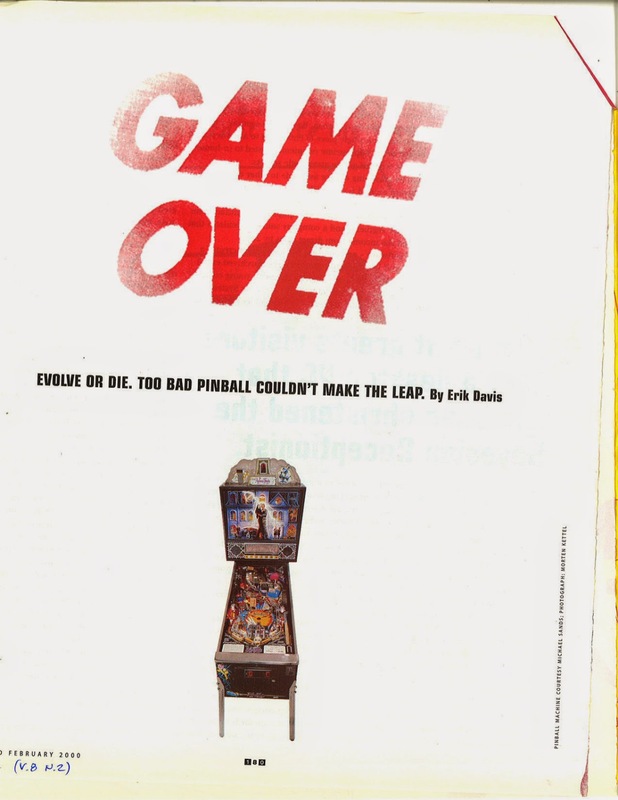 It wasn't infuriating like the first page had been, where I was thinking that Wired just had their facts grievously wrong about what I saw as a thriving pinball scene. Instead, it was sad, and frightening. THIS was the length that people were convinced that pinball was dead. WIRED MAGAZINE was willing to put it in print and run it. I feel so lucky that Alec and I got into pinball when we did, but this makes me admire those who went through the pinball dark ages! It's a testament to the strength of the community, and the enduring enthusiasm that pinball fans, operators, and designers have for the craft. Again, going through the early 2000's wasn't part of my pinball narrative, so reading this article and seeing the articulation of the sentiments at the time was really fascinating. If you are interested in checking it out, I found it archived HERE. In May I traveled to Toronto, Ontario in Canada for the Toronto Comics Arts Festival. I was stoked to find that Toronto came up on the Pinball Map app, but sadly, the neighborhood where the festival was taking place was pretty far from any of the machines on the map. 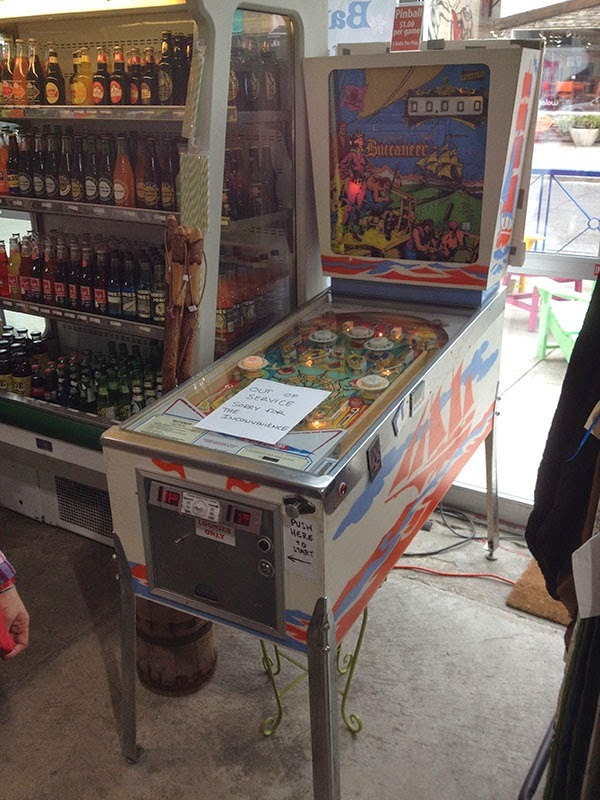 The only machine I saw while I was in Canada was this Buccaneer in a shop in the Kensington Market area. Tragically, it was out of service. I still don't think I've ever played pinball in Canada. One of these days!!! A few weeks later, back in the states my wife Claire and I were up in Oakland seeing a movie, so we swung by the Legionnaire Saloon to play a few games of Monster Bash. The machine had a full-color LED dot matrix display, which I have been seeing more and more of lately. They are super cool looking! I kind of want to get one for my Medieval Madness machine, but they are still pretty expensive... I know a lot of work went into graphics, hand painting every pixel, so they are worth every penny. I guess I just gotta save up for it! Then, at the end of the month, I was in Chicago for the CAKE festival. After day one of the show a big posse of friends once again headed down to Headquarters Beercade for some free pinball. Yes, I repeat, FREE PINBALL. It was a good way to wrap up the month of May! 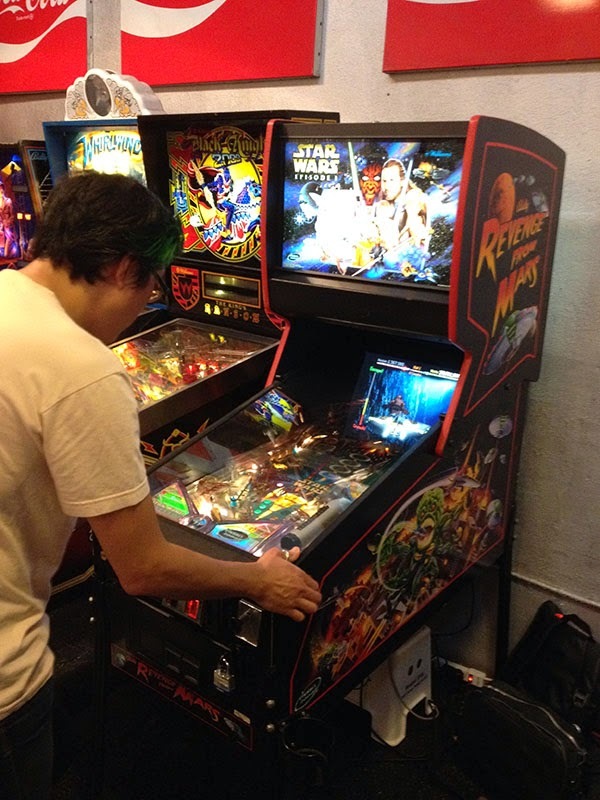 There's a new SW:E1 pinball machine in the Bay Area! It used to be that the only Star Wars: Episode One pinball machine in the San Francisco Bay Area was at Playland Not-At-The-Beach. Don't get me wrong, PNATB is great, but it's only open on the weekends, and it's a bit of a hike to get up to El Cerrito. Back in May, my buddy Gene X Hwang sent me a tweet asking, "Guess what machine they just got at Free Gold Watch?" Gene knows that SW:E1 is my favorite machine, and we have been trying to find some time to make it up to PNATB so that I could show him what I know about the game. I replied, "No way!" and we set a time to meet at Free Gold Watch to play the machine... on May the 4th (be with you!) Appropriate, right? This was cool because it made the picture much more crisp and bright, but also because it meant that the cabinet wasn't quite as heavy. 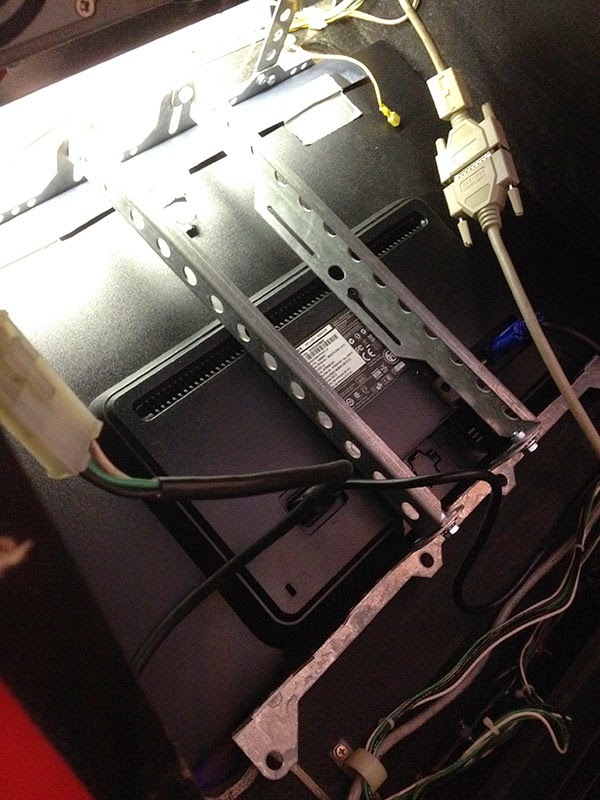 Usually it's pretty much impossible to move this machine around, but it was slightly more possible with this lighter monitor (though the tilt was so tight, we were both tilting). If memory serves, Gene got a high score and I couldn't put a good game together. Anyway, I'm stoked there's another SW:E1 machine in the Bay Area and I will definitely be playing this more, in my attempt to beat the machine. Figuring out my Dream Machine layout for HP6. Assets for Drop Target #6 are underway! We're still aiming for a September release, in time for SPX. Thanks for your patience - we know it has been a long wait this time around. We've got a bunch of cool stuff planned, so hopefully it'll be worth it! Last week, I showed off some oddball points from the PAPA collection, as well as some glamour shots of the games Josh, Joyana, and I played. This week, I want to focus on the Zaccaria games that we played. As I said last week, I made a special effort to play a bunch of these games because I have never seen them anywhere else before, and I don't know where else I'd see them. <- Oh man, you guys, ROBOT. As a quick aside, I LOVE robots. I've been obsessed with Tokusatsu (the genre of Japanese television that encompasses Power Rangers, Ultraman, Godzilla, and the like) since forever, and robots are a big part of that genre. The art on this game was amazing. My photo doesn't do it justice, so PLEASE check out the IPDB link above and get a better look. The purple/red color scheme is unexpected, but really intoxicating. It helps with the setting of the game. This really distinguishes itself from Terminator in that way, where I don't feel like I'm on Earth beating back robots. I feel like I've actually transported myself to the robot homeworld, taking the fight to them!! Theme and aesthetics aside, this was a very fun game to play. There are some slingshots and some bumpers at the top, which make for a very lively upper playfield. The lower playfield SEEMS to be empty, until you hit the ramp in the center. A quick note about the ramp: when you hit it, it immediately u-turns you up and heading back towards the player. I can't actually think of another example right now. Needless to say it feels very unique. <- Time Machine. This was a really bonkers game. The basics are that there are two time periods, the past and the future. You hit targets to prep your time machine to travel in-between the two periods. 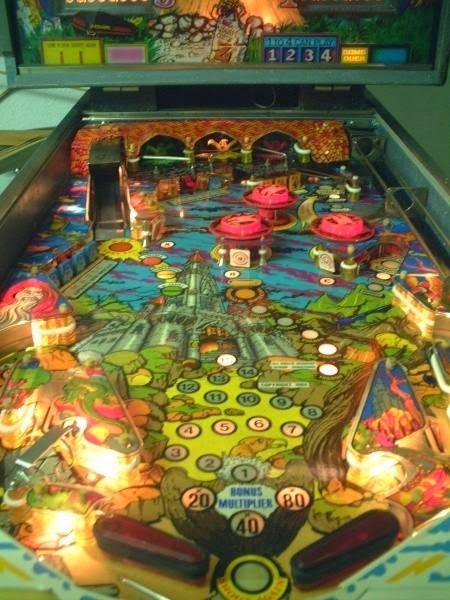 Once you get your ball in the Time Machine scoop, the playfield changes DRASTICALLY. A good square foot raises and lowers in the center to showcase either a bank of standup targets or pop bumpers. You know, I REFUSE to go on until you see this beauty in action. HERE. It's okay, I'll wait here. Cool, huh!? The concept of changing the field so drastically REALLY reinforces this idea that the player is literally traveling between different planes of existance. It's an idea I've never seen before. The normal beeps and boops of gameplay sound is nothing to call home about, but oh man, the SPEECH! The game is practically narrated by a character who I assume is some sort of super time wizard. He tells you when you are going into the past and the future, and also helps you out. In the past, you have to hit 10 (?) standup targets in the back. As you hit a target, the light in front of it turns off. If you then hit a target you've hit before, the wizard gives you a tip to hitting one that's still lit. "More to the right." "More to the left." It's just a little programming trick, but it's very cool to hear while you're playing. Also, everything is in English, but there are a couple of lines that didn't sound quite right? My favorite was "You're going well." We also played some games on Magic Castle and Fire Mountain, and we had an equally fun time on each. This brings me to my overall observation after playing the Zacarria games. I felt like I was experiencing something wholly new and unique, yet familiar. There were trappings of American pinball from the late 70's, early 80's that I recognized, for sure, but each game, without fail, was bringing something new to the table. One of the things that I worry about with pinball is that we're going to get into too much of a feedback loop. I love that pinball, although it has roots in France, is a very American art form, but I see a little Italian publisher like Zaccaria come around and blow the lid off my expectations with every game, and I wish that there was more international pinball. Video games have flourished in the last two decades by having companies in North America, Asia, and Europe all competing against each other. This is obviously a larger issue, but it's something that I thought about while hitting down those five robot pop up targets. I would love to see the Japanese gaming aesthetic back in pinball. Data East closed up shop in 2003, and have we had a non US pinball manufacturer since them? I honestly don't know! Please send them my way! I have no other way to describe my experience playing Zaccaria games than to say that it just felt FRESH. It was undoubtedly my highlight of the trip. Phew! Well, I thought I was going to get through everything this week, but I have ONE MORE machine that I want to talk about. It was the last one we played before we left, and man oh man, it was strange! Get ready!